Do you let your face fly fancy-free? It is such a clever name and idea! Bell Hooks is a very quotable author who writes about feminism/gender, race and capitalism, while Saved by the Bell is an old, cringe worthy show that had my 12-year-old feminist self squirming in my seat when I watched it. 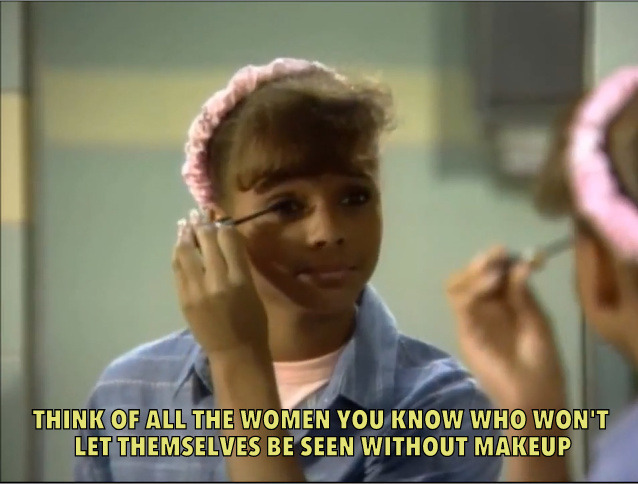 Saved by the Bell really does get saved by Bell Hooks when her quotes are paired with images from the show, helping me replace some of the gag-worthy memories of the show with happy ones. As I started looking through the tumblr when I got home, I quickly came across the image above. It was so fitting because it reminded me of another conversation I had with a different cool person that I met that night. This cool person shocked me when she said that she never leaves her house without a full face of makeup, and that her parents were the only people who have seen her fresh faced (aka without makeup). This was something that she wanted to change, but didn’t feel ready to yet.